To all who experience illness, it is not fun at all. To all who experience chronic illness, it’s frustrating and nerve-wracking. We can get on our feet and enjoy our blessings until BAM! It’s there. Always there. Jerking us around and dragging us down. This past week was tough for me, and this week I’m still weak. My voice refuses to return. Not ready, I guess. When I try to talk more, it wears me out, my airways get more sore, and I cough more. I have a chronic inflammatory lung disease called sarcoidosis, and it doesn’t take much for my airways to strike up a battle. Those annoying green monsters like you see on Mucinex commercials are real. They love to inhabit my airways. They know my weak spots and shove their way in. Uninvited. Unpredictable. Unsafe. As I deal with this ongoing intruder in my life, I like to hide behind “I’m ok” or “I’ll be ok.” I guess because I think I’m complaining if I tell it like it really is. Or I don’t want to worry loved ones. So I try to hide the truth, even to the point of denying the inevitable signs that I need the help of an extra boost of Prednisone and/or antibiotic. When I hide the truth, it only harms me and sets me back further. When I don’t allow my emotions to surface, they work themselves into a vicious cycle. They get more raw during the times I get sick. Probably magnified by past abuse. When I feel no control over my sick body, it triggers those past emotions of helplessness. This was after a day of sinking into depression. I felt so sick, and when I’m sick, I can’t think, and when I can’t think, I can’t process all the emotions roaring inside of me. I have trust issues, especially towards God. My abuser, a so-called “mouthpiece of God,” broke it. Tragically. And though I have come far, that distrust rears its ugly head, especially in times of weakness. Last week I realized I too often don’t trust that Jesus’ hands are warm, loving, and safe. I don’t trust that His intentions are pure and longing to heal, not to harm. So I keep trying to control my own life. I want to fix things myself, because I don’t trust someone else to fix it for me. I once went to a minister for counseling, and look what happened. Asking for help hurts. Putting my welfare into someone else’s hands scares the wits out of me. 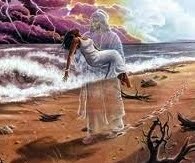 As I cried and struggled, Jesus told me to quit resisting Him, to trust Him, and to lay my weary head on His shoulder, to trust His loving, tender, and safe embrace. He whispered, “I am always here for you, My child. No matter what you do or don’t do, I will always love you. No matter what happens in your life, I will always love you.” It calmed my troubled heart. God renewed His promise as I finished reading a book by Kristen Heitzmann – The Still of Night (A Rush of Wings Series #2) . Kelsey, a young teen who died of leukemia, wrote in a good-bye letter to Morgan (her birth father), “Do you know Jesus loves you? I hope you do. He loves you no matter what you’ve done or haven’t done. He’s always loved you. And no matter how bad things get, His love sees you through it.” My heart stilled and soaked it in. The same healing balm a second time that day. If you are struggling with chronic illness and/or emotional pain, I hope what I have shared will give you a glimpse of hope and strength. No, not just a glimpse, I hope and pray Jesus will lift you up and hold you so close to His heart that you will hear the rhythmic beating of His love for YOU.